As you know all 3 of my babies use their outdoor enclosure for a couple of hours during the day. On Thursday evening my daughter (who is 17) let them out to the enclosure as normal and they were playing away. I'd been working late and when I phoned home at 7pm Ashley advised that Lenny had fallen of one of the platforms in the run and seemed to be limping. I came home immediately but to be honest he seemed okay and whilst he was licking and shaking his paw a bit he was playing away and running about as normal. To cut a long story short he has seemed ok since then but today he was limping again and on multiple close inspections it looks like he has hurt one of his middle toes - don't know if this is staved or broken but looks a bit swollen. Am not even sure if it is related to the Thursday evening incident. He's been unable to put any pressure on it all evening so its off to the vets tomorrow. Was coping ok until an ignorant remark was made by one of my in-laws to the effect that his toe would need amputated. I'm really distressed by this. Not sure if anyone is on-line tonight but would appreciate any advice. I know it will depend on the vets tomorrow but need some reassuring I think. But in your case, the vet is the only person who can tell you whats wrong I think. Please try and be positive If anything you will get some peace of mind. I hope Lenny recovers soon. Let me know how you get on. Julie, thanks for picking up my post. So glad someone was online. Lenny will let me touch his paw in general but the minute I go near the sore toe he cries out. Its so upsetting to hear this that (to be honest), I've not looked at it more than twice tonight. It definitely looks swollen, no obvious cuts or anything. I went up stairs to try and sleep but couldn't. I want to keep checking Lenny but he's gone to the 'little bengal boys bedroom' and everytime I go in I am disturbing them all. They like to sleep huddled together . I think I was ok until the comment was made around removing his toe and since then I have been really upset. My vet opens at 8am and I'm going to phone then to see if he can have a look at Lenny first thing. Thanks for your kind words and please keep your fingers crossed for Lenny. I'll bet he was trying out for his "no fear badge"! He might of sprained something slightly.....He's still young and very subtle, I very much doubt he's broken anything. Check his pads and make sure theres no splits, cuts or foreign bodies lurking. If you find something just clean it up with some salt-water solution and dab on some sudocream or similar! If he still won't put any weight on it by the morning then take him along to the vets, He/She will just give him a few shots to ease any pain and swelling......If he'd of broken something you would know for sure. It's a bit harsh of your in-law to say something like that, But you gotta remember "there's one born every minute"
Don't let them get you down.....just ignore idiotic and heartless comments like that. In fact I have a little secret weapon I'm willing to share with you.....It might cheer you up, works great in these situations too! I reccomend the top of the range "La Grande" .....I dare you! and as Meemonkey said, it's most probably just sprained. Keeping fingers and toe's crossed for little Lenny, please let us know how he get's on. Lenny was no better yesterday morning so we took him to the vet. Verdict is out - his toe is that swollen that the vet is not sure whether it is broken or just staved. He's given him a shot of antibiotics and also 5 days worth of painkillers. If no better in 5 days (or if he worsens) we will take him back. Gentle play for the little man for the next wee while which is really difficult with 2 very active leopard brothers!!!! We took his litter mate brother Loki along for company in the carrier (Lenny and Loki hate to be seperate). Think the vet thought we were nuts but the important thing for us is that it kept Lenny happy. When the swelling goes down they should be able to tell you more then. Hi Julie, thanks for being there for me in my moment of "panic". Lenny seems to have a bit more mobility today so fingers crossed it is just staved. I've never had a female bengal, only the boys as you know, and Meemonkey has advised they can be a bit more in your face. That said, I've only a month before Lubo can be neutered and 2 months for the babies, this should help calm them a little. I am contemplating holding off a bit with Lubo and having them all done on the same day (advised by vet this would be best). If you are keeping a stud however............LOL. Seems to be the case that a lot of breeders keep their unneutered males outside and only let them into the house for short spells each day. 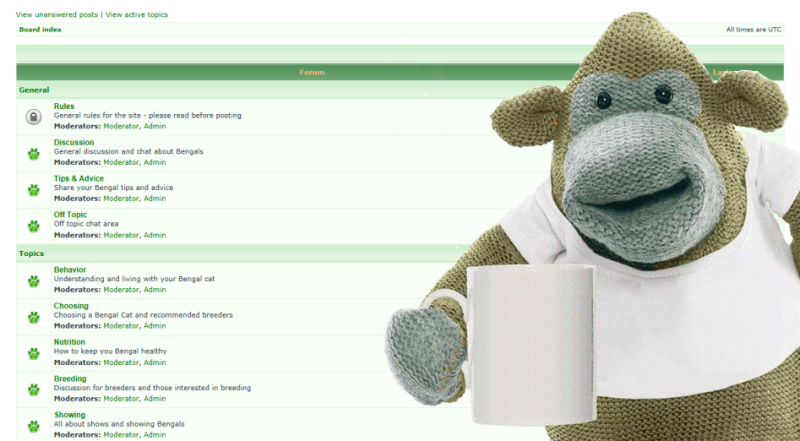 I'm sure this is what Meemonkey does. I would imagine they can be a right handful when they are fully grown. They are however (in my short experience), very loving, affectionate and I would not be without them. Hows Lenny's toe today, i hope he's on the mend. Lenny's toe does seem to be getting better but I am struggling to persuade him to let me have a look at it . He is just going to have to put up with me have a good look tomorrow as I want to make sure we don't need a return visit to the vets in advance of Monday. I agree with the affection comment you made. Up until we got the boys all my previous cats (just good old moggies) had been female and not nearly as affectionate as my bengal trio. I wasn't sure if this was due to breeding but sounds as if its not as straightforward as that. Something funny, going to a party tomorrow night and therefore decided to 'top' up my tan with some assistance from a fake spray (from the local beauty salon). The boys have sniffed me up and down in disgust tonight - they absolutely hate the smell (I cannot shower until tomorrow). NO CUDDLES TONIGHT! I did want to say, that if Lenny's TOE is nearly as sensitive to "pressure" as my thumb that is chipped at the knuckle joint; he isn't going to be keen on having you examine or otherwise "mess with" it. I can really empathasize with the little guy! Lenny is definitely on the mend albeit I've had to refrain from wanting to check his toe 20 x a day - he was becoming very grumpy with me. Sorry to hear the wee man has hurt his toe, but sounds as though he's on the mend. Lenny is definitely over the worst and running about chasing a laser light as I type!!! His nail has not fully retracted back in yet and looks a little bent - just keeping an eye on it and if need be ..... back to the vets we will go!! !